Red Flash, the rock star, biggest of the big when it comes to flashy attention getters. 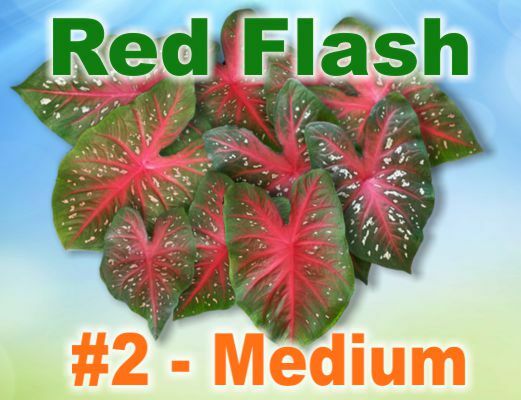 This variety of caladium outgrows all other caladiums hands down. 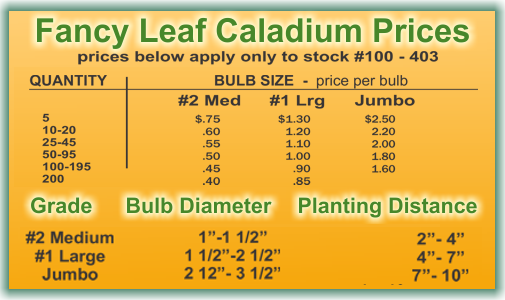 Leaf size and height are usually much bigger than a typical caladium. The leaves are thick and heavy so they stand up well under the bright lights of stardom or sunshine. Wardrobe starts with a deep green edge that is overlaid with heart pumping red veins. Add to that, tiny white rhinestone-like flecks that are scattered throughout the leaf. There is not another performer who comes close. Perhaps rock stars are too loud for your garden? Try Brandywine. This variety is a bit more folksy, but still very showy with his rich red hues. Should you want something entirely different please feel free to peruse our Availability Page to see a small glimpse of every variety of caladium that we sell. Similar varieties can be accessed from the links below.